I'm back once more with another entry in Toho's Showa library. I've chosen to segue away from Godzilla himself this time and take a look at a sequel to an earlier film I reviewed: Frankenstein Conquers the World. As you may recall, that film involved the accidental resurrection of Frankenstein's monster through the atomic bombing of Hiroshima and his subsequent growth to kaiju-sized proportions. At the end of the film the monster (and his enemy Baragon) were seemingly killed during an earthquake. Well, now he's back (again). Sort of. Before I start, a bit of an apology. I realize this is a bit late; I've hit the point in the Showa series where films are becoming increasingly difficult to find, either as physical or digital copies. This film and the next two on my list each took about a month to locate and collect. I prefer to have at least a couple of films prewatched in my queue before I write a review so I have time to digest what I've watched and reflect on it. That being said, the other reason I've been slow is that I've just been pretty busy with a number of other things, such as my new job. And I also was a little bit tokusatsu fatigued a couple months back. So I'm sorry this wasn't finished earlier. I realize very few people (if anybody) was on the edge of their seat waiting for another old kaiju movie review, but I do feel a level of responsibility to keep to a schedule. And I dropped the ball somewhat on that. 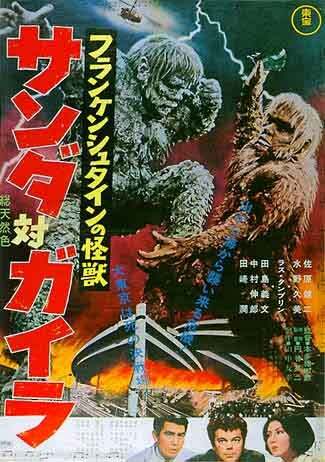 As kaiju movies go, Frankenstein Conquers the World was a decent success. It may not have made as much money as Toho's star monster, Godzilla, but the studio felt comfortable enough with the film's performance to greenlight a sequel for release less than a year later. Deciding to double down on the formula of an enlarged Frankenstein's monster, the new film featured not one but two monsters who would (as the Japanese title indicated) fight one another. The film takes place about six years after the first film, which took place in 1960. The action begins amid a stormy sea (a typical opening for many kaiju films of this era), as a fishing boat struggles to make it back to shore. On their way, the boat is attacked by an enormous octopus (named Oodako, like the similar creature in King Kong vs. Godzilla), which kills several of the crew. As if that weren't enough, another monster suddenly sprouts from the ocean - an enormous humanoid giant - and attacks both Oodako and the boat, destroying both. Some time later, the crew's sole survivor is rescued and relates what happened. Most assume his tale of a giant Frankenstein (gargantua in the English version) attacking the boat is pure nonsense, but noting the similarity of his description to an earlier creature, the press seek out Dr. Paul Stewart and his assistant Akemi, who previously raised the creature in captivity. Dr. Stewart and Akemi reject the survivor's story, saying that the creature they were familiar with was gentle and wouldn't attack humans. Furthermore, Stewart is skeptical that such a creature would be found in the ocean, since it came originally from the mountains. The sailor's tale is vindicated, however, when another attack is reported and the monster is spotted off-shore. Things become more confused though when shortly thereafter a very similar monster is spotted in the mountains, as Stewart had surmised. Perplexed by this, the scientists surmise that both may in fact be spawn of the original Frankenstein's monster, whose regenerative powers may have caused flesh he shed during the previous film's events to grow into entirely new creatures. This realization leads to another: if the Frankenstein's monsters can reproduce in this way, then fighting them might actually prove apocalyptic, spawning an entire horde of similar creatures. While the scientists try to figure out the situation, Gaira (the aquatic giant) emerges on the coast of Japan, attacking an airport and a nearby city, eating several people. In response, military aims to combat Gaira by any means necessary, while Stewart and Akemi attempt to convince them that Sanda (the mountain giant) is innocent of wrongdoing and that attacking either giant may actually worsen the situation. Sanda meanwhile, must decide whether to trust humanity or his "brother" Gaira. As seems to have been the norm for kaiju sequels during the 1960s, the connection between Frankenstein Conquers the World and The War of the Gargantuas is surprisingly tenuous. While it's clearly indicated that the two monsters are the spawn of the original monster, almost all other references to the original film are strangely vague and are even pasted over at many points by remarkably similar (but distinct) events. For example, the film features an American scientist (Stewart) and his two Japanese assistants (Akemi and Majida), who together rose and observed in isolation a radioactive feral child, who later escaped and grew to an immense size. The American emphasizes the boy's scientific value. One of the assistants (Akemi) favors befriending and protecting the monster. The other (Majida) believes he's a danger who should be destroyed. This is exactly the set-up of the previous film; the female assistant is even played by the same actress (Kumi Mizuno)! However, their names and slight differences in the events indicate they're all new characters. It seems likely that Ishiro Honda and Takeshi Kimura, who co-wrote the film together, intended to reunite the original cast from the first film and wrote the script under that assumption. If that's the case, it's also possible that Nick Adams, who starred as the American scientist in the first film (and who as also featured in Invasion of Astro-Monster) was too expensive or otherwise unavailable, which led to a recast. I've yet to find anything that proves this scenario, but given the ridiculously similar personalities, relationships, and circumstances of the characters, it seems likely. In addition to rehashing some of the previous film's events, The War of Gargantuas also makes use of some ideas that were cut from the original. For example, the idea of a giant Frankenstein's monster eating people was an idea that originally rose its head during the scrapped production of Godzilla vs. Frankenstein, wherein the Japanese military would turn to Godzilla in desperation to kill the anthropophagous titan. Likewise, the battle at the beginning of the movie, between Gaira and Oodako was based upon a similar scene filmed for Frankenstein Conquers the World and then cut, both on the American production team's request. Details about the scene had made it out to the public and frustrated with the ensuing confusion when Oodako never appeared, Honda reshot the scene for the sequel. Compared to its predecessor, The War of the Gargantuas is further removed from its source. There's a lot less discussion about humanity's hubris or the destructive power of science in the wrong hands and a lot more monster fighting. This may partially have been a response to the increasing popularity of monster smash-ups generally: at this point in time, Godzilla movies generally featured about two or even three monsters besides the King himself and Toho was moving away from its original model of introducing each monster individually, in its own film. By the end of the Showa era, many monsters who'd started off on their own (like Rodan) would be relegated to guest stars in Godzilla's shadow. That being said, the focus on monster fighting doesn't mean Gargantuas isn't without some degree of pathos. The crisis at the heart of the movie - whether fighting the Frankenstein's monsters might actually make things worse - is actually kind of horrifying, especially given the increased hostility of Gaira over either Sanda or the original monster. To some degree, Gaira resembles the eponymous titans of the hit anime Attack on Titan, a comparison my brother and I both made while watching the film (I even joked that this was the origin of the titans - nuclear irradiated spawn of Frankenstein's monster who spawned through shed cells). In that manner at least, Gargantuas actually comes off as more grave than its predecessor. The production values of Gargantuas are somewhat of a mixed bag. On the one hand, Akira Ifukube's soundtrack is stirring and evocative, a necessity for a film with as apocalyptic themes as this one. On the other hand, the creature design for Sanda and Gaira hasn't aged terribly well and looks a bit silly next to the comparatively simple elegance of the monster's design in Frankenstein Conquers the World. Both are covered in hair that doesn't really look like hair and have a goofy grin that gives them more of a resemblance to the bigfoot in Harry and the Hendersons than Frankenstein's monster. Reportedly, the American team's dissatisfaction with the look is why the creatures were called "gargantuas" in English and all references to Frankenstein were removed. Still, as a sequel to Frankenstein Conquers the World, War of the Gargantuas isn't a bad effort and it's probably one of the last Showa films to make an effort at telling a kaiju story with some amount of gravity. The film probably would have been better with a stronger connection to the original film and a slightly less goofy design for the monsters, but it does hit most of the right notes. If you like the first film it's probably worth checking out. If you haven't, it's still an interesting variation on the X fights X theme common to kaiju films.